Make the beans: Combine beans, oregano, and 1 teaspoon chili powder in a small saucepan and cook over medium heat, stirring occasionally. Cook until heated through, about 2-3 minutes. Remove from heat, cover, and set aside. Empty the Trader Joe’s cornbread mix into a bowl. Add 1/2 teaspoon chili powder, and a pinch of salt and pepper. In a separate bowl, whisk together the melted butter, milk, and egg until well combined. Combine wet and dry ingredients, mixing just until blended, leaving small lumps. Heat a large skillet over medium-high heat, and spray with cooking spray. Add the batter, 1/4 cup at a time. You may have to work in batches, depending on the size of your skillet (if so, spray pan with oil again before each batch). Cook pancakes until they are browned and puffy, about 4 minutes, turning once. 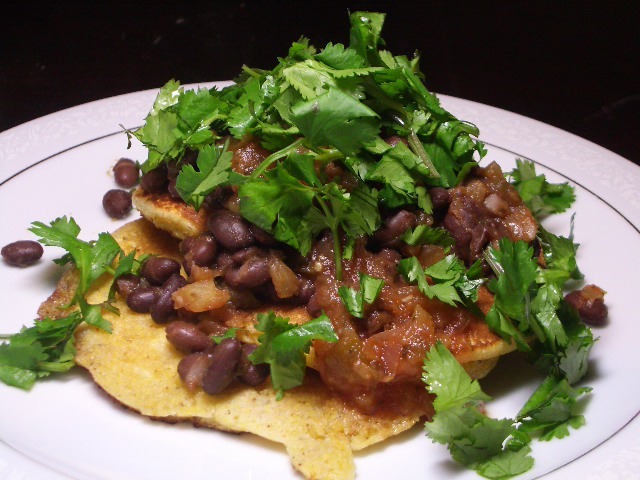 Divide among plates, top with beans, salsa, and a handful of fresh cilantro and serve.